Add butter, sugar and syrup into a small, heavy-based pan. Heat gently until the butter has melted and the sugar has dissolved. This will take about 7 – 8 minutes over a low heat. Don’t let the mixture boil as it may crystalise. Leave the mixture to cool slightly, about 2-3 minutes, then sieve in the flour. Pour in the lemon juice and stir to mix well. Drop four teaspoonfuls of the mixture onto each of the prepared baking tray to make neat circles, about 10 cm apart then sprinkle a small amount of coconut on to each drop. Bake in the pre-heated oven for about 10-15 minutes, ( I found 10 mins was sufficient ) or until the mixture is well spread out, looks lacy and is a dark golden colour. 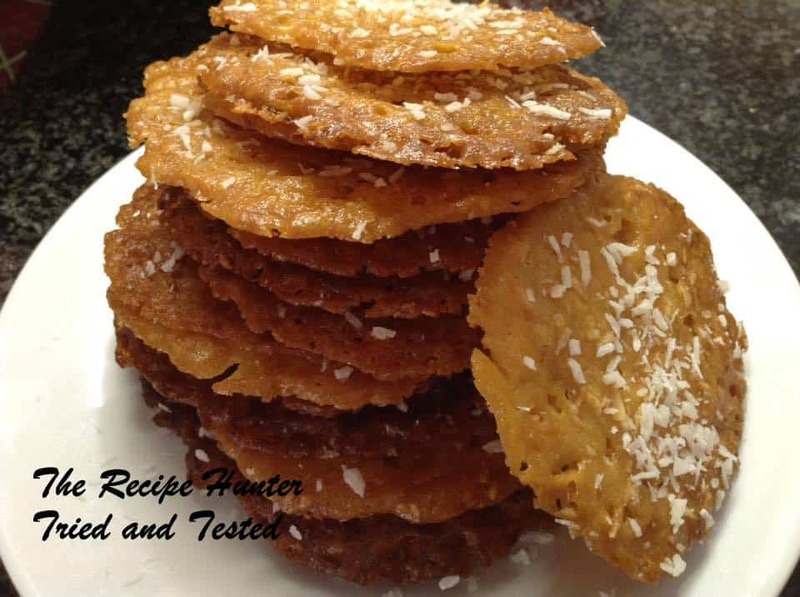 Once baked, quickly remove from the oven and sprinkle a very small amount coconut over the cookies whilst they are still very hot. Leave them on the baking tray until they firm up and then transfer to a cooling rack. ***Note: the dough becomes like putty after I baked the first batch. Have a cup of boiling water handy and dip your spoon into hot water to make it into a spreadable circle.